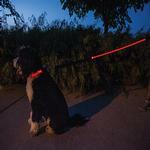 GLOPUP LED Dog Collar in Red allows both you and your dog to always be visible and safer during early morning, early evening or night time activity. Reflective stitching for added reflectivity. Quick release buckle is made of hardened plastic for durability and no accidental unlocking. Collar can be washed by removing battery pack and LED inner core. Powered by two replaceable 3V lithium batteries (CR2025). Battery life lasts approximately 48 hours of blinking. 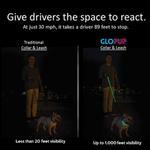 GLOPUP is visible up to 1,000 feet away to alert oncoming drivers and give them time to stop. It offers 3 lighting modes for every situation: Quick flash, Slow Flash, Steady On. It is made of highly durable, comfortable polyester webbing for a long life. It uses reflective white stitching for added headlight reflectivity. GLOPUP is weather and water resistant so it is no problem to use it in the rain (just don’t go swimming with it as it cannot be submerged in water). In addition to safety, the fun bright colors bring play time and hours of entertainment to a new time of the day. 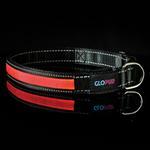 GLOPUP can replace your usual collar and leash. Just turn it on when it starts to get dark. 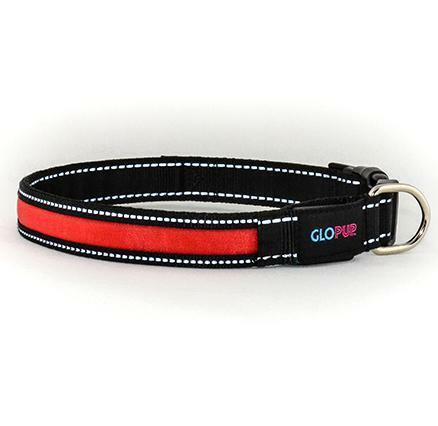 Simply press the GLOPUP logo on the collar to turn on the LED light and select which of the three lighting modes you prefer. The LED light comes from the battery pack under the logo and the light is sent through a small inner core that runs along the length of the collar. 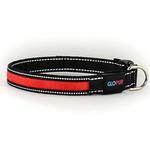 Uses polyester webbing, hardened plastic and stainless steel. Available in three different colors (Green, Yellow, Red). 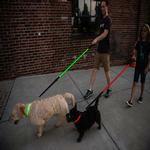 Matching GLOPUP LED dog leashes sold separately.